Ice dam removal is important! with no damage to your roof and gutters! 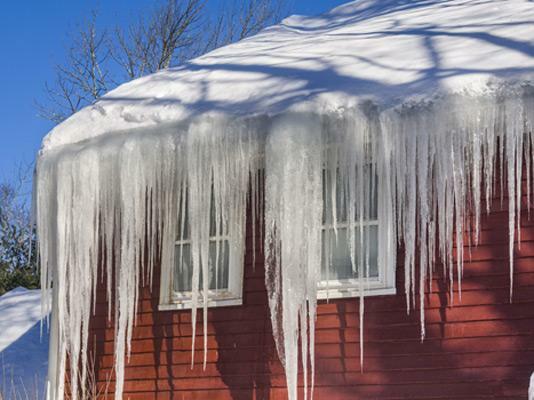 It's because the same conditions that allow icicles to formsnow-covered roofs and freezing weatheralso lead to ice dams: thick ridges of solid ice that build up along the eaves. Dams can tear off gutters, loosen shingles, and cause water to back up and pour into your house. When that happens, the results aren't pretty: peeling paint, warped floors, stained and sagging ceilings. Not to mention soggy insulation in the attic, which loses R-value and becomes a magnet for mold and mildew. Ice accumulates along the eaves, forming a dam. Meltwater from the warm roof backs up behind it, flows under the shingles, and into the house. There is a complex interaction among the amount of heat loss from a house, snow cover, and outside temperatures that leads to ice dam formation. 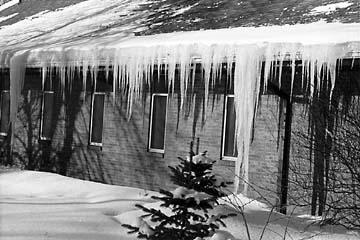 For ice dams to form there must be snow on the roof, and, at the same time, higher portions of the roof's outside surface must be above 32 F while lower surfaces are below 32F. For a portion of the roof to be below 32F, outside temperatures must also be below 32F. When we say temperatures above or below 32F, we are talking about average temperature over sustained periods of time. The snow on a roof surface that is above 32F will melt. 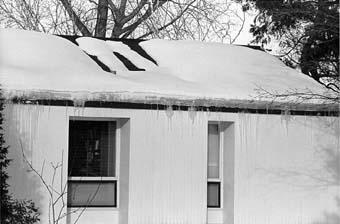 As water flows down the roof it reaches the portion of the roof that is below 32F and freezes. Voila!an ice dam. The dam grows as it is fed by the melting snow above it, but it will limit itself to the portions of the roof that are on the average below 32F. So the water above backs up behind the ice dam and remains a liquid. This water finds cracks and openings in the exterior roof covering and flows into the attic space. From the attic it could flow into exterior walls or through the ceiling insulation and stain the ceiling finish. 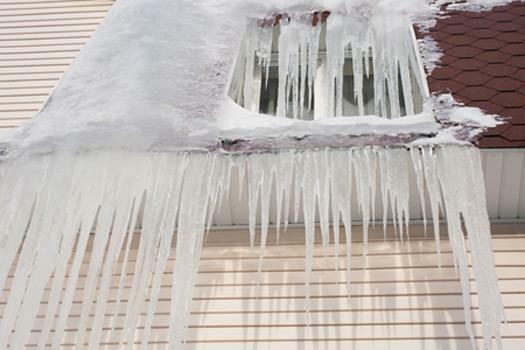 In all communities subject to extended cold or freezing spells ice dams are an eventual problem. 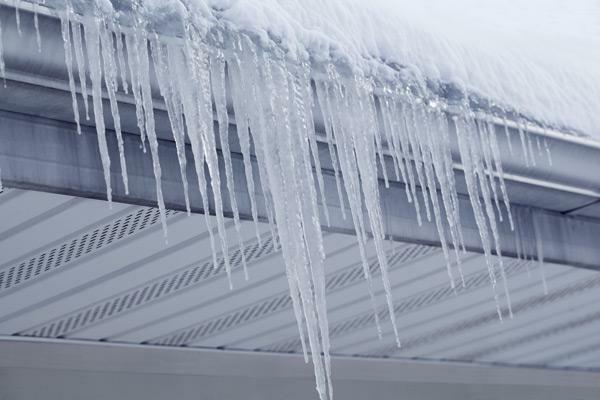 Ice dams can be prevented by controlling the heat loss from the home. Both of these actions will increase the snow load that your roof has to carry because it will no longer melt. Can your roof carry the additional load? If it is built to current codes, there should not be a structural problem. Roofs, like the rest of the home, should have been designed to withstand expected snow loads. In many areas, plans showing design details to meet expected snow loads are usually required to receive a building permit. The plans for your home may be on file at your local building inspection office. To help you understand the plans, or if you cannot find plans for your home, you may want to contact an architectural engineering firm. A professional engineer should be able to evaluate the structure of your home and answer your questions about the strength of your roof. 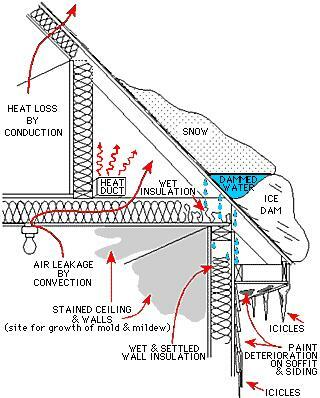 Mechanical attic ventilation IS NOT a recommended solution to ice dams. It can create other attic moisture problems and may cause undesirable negative pressure in the home. A blower door test should be used to evaluate the airtightness of your ceiling. In addition, an infrared camera can be used to find places in the ceiling where there is excessive heat loss.